This weekend has been so exiting! New collections have been shown in Milan and each is a highlight itself. I try to watch as many shows as possible online and in between I just wrapped up a great shooting with my friend. You’re going to see the results very soon 😉 Firstly, I have to pack my suitcases again because I’m leaving to Dubai tomorrow morning. I’m so curious and I’m looking really forward to these holidays! If you guys have any special tips for Dubai let me know in the comments. It was the premiere of Peter Dundas. 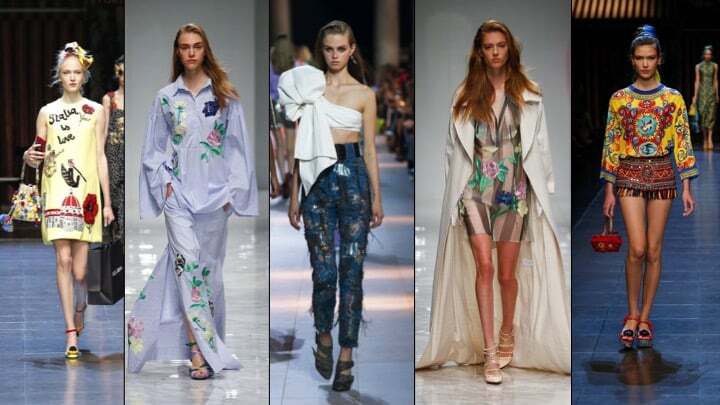 With his first collection designed for Roberto Cavalli he showed his amazing skill and his fantastic sense for fashion. The collection was bright and colorful with awesome prints and pastel tones. One sticking extra was definitively the long train which was a part of several outfits. The clothes were all really glamorous and they had this special touch of lightness. For Shoes, Dundas chose particulary ankle boots – in all colors and styles. We should keep them in mind guys. 😉 So, with his first collection for Roberto Cavalli Peter Dundas showed his high standards and I’m sure we all wanna see more – may a new era of Roberto Cavalli begin! Guys I have to admit it – I officially fell in love. The new spring / summer collection from Dolce & Gabbana was just everything! You know, I love Italy. The attitude the Italians have and how they enjoy their life living la dolce vita – I love it. 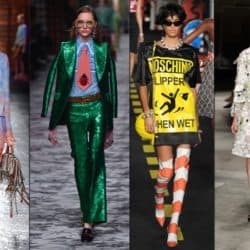 And now, the two geniuses of fashion also known as Domenico Dolce and Stefano Gabbana managed it to bring this whole vitality into a collection. It was all about vibrant colors and amazing prints which were mixed and matched stunningly. On the fabulous dresses you could see fantastic applications of beach motifs, flowers or names of different italian cities. The highlight of the show was the “Selfie Part”. During the whole fashion spectacle the models took selfies on the runway which were shown on screens right away. In this way, the lucky viewers could be a part of the show and the whole atmosphere was much easier than on a usual fashion show. Well, all I can say is Italy is love! Another beautiful collection was shown by the label Blumarine. All the clothes were coined by lightness and floral motifs. There were lots of bright colors and pastel tones. But it wasn’t only about light blue, white and pink – there were also wonderful black dresses and a lot of transparency. What I loved especially about this collection were the looooong coats. Sometimes they truly reached the floor but they still looked really light and glamorous due to their soft looking fabrics. Have a wonderful rest of your day guys! Posted in Inspiration and tagged Accessories, Bags, Beauty, Blog, Blumarine, Classics, Coats, Dolce & Gabbana, Dresses, Enjoy, Fashion, Fashion Week, Fashionblog, Feel Good, Glamour, Italy, MFW SS16, Milan, Milan Fashion Week, New Trend, Peter Dundas, Roberto Cavalli, Runway Report, Spring Summer 2016, Style, Sunday, Trend. Bookmark the permalink. Einmal das schwarze Kleid von Cavalli bitte <3 Oh Gott wie schön das ist!